While the check-in started with social apps tied to location in the real world, it quickly spread to the virtual side of things, giving users the ability to check-in to watching tv/movies, listening to music, browsing websites, etc. But one area that remained largely untapped was gaming, which is surprising because it makes a lot of sense. IGN clearly agrees. 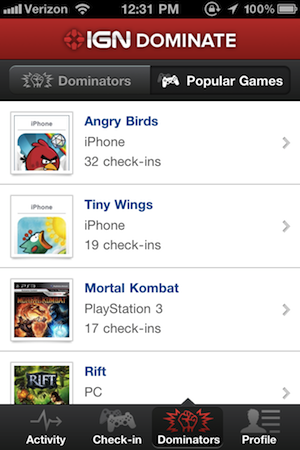 The gaming network has just entered the space with their first app, subtly titled: Dominate. The iOS app has just hit the App Store today. So what is Dominate? It’s an app that allows you to check-in to any game you’re playing and share that information with your friends (via Facebook/Twitter). 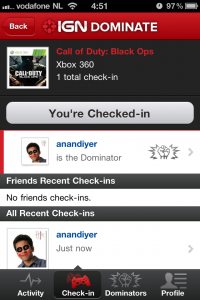 And yes, if you check-in to a game often enough, you’ll becomes the “Dominator” of the game — think: Foursquare Mayor. So how is this different from the few other players in this space, notably Heyzap which launched similar functionality recently. Well, Heyzap focuses on mobile gaming only, Dominate wants you to be able to check-in for every type of game you’re playing across all the major platforms (mobile, game consoles, PCs, etc). And this make a lot of sense since it keeps with IGN’s tradition of appealing to all gamers, no matter the genre or platform. Right now, the app is pretty barebones. But it’s also very fast and does exactly what it needs to. The plan is to get this out there and gain feedback from the IGN audience. (Push) Notifications for when people you are following start playing a game. IGN just acquired rival UGO last week in anticipation of a roll-out from parent News Corp. in a few weeks. 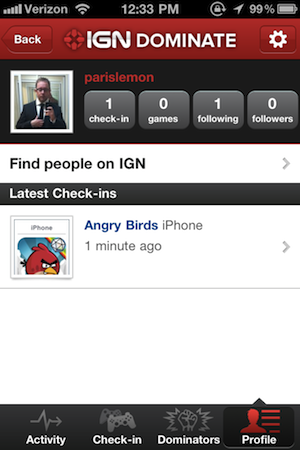 Find IGN Dominate here in the App Store. It’s a free download.